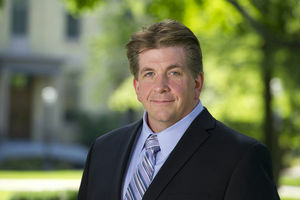 Rich Taylor, a member of the University of Notre Dame faculty since 1995, is a professor of chemistry and biochemistry in the College of Science. Taylor, who also serves as associate vice president for research at the University, has recently been appointed as interim director of the Warren Family Research Center for Drug Discovery and Development. The Warren Family Research Center for Drug Discovery and Development is focused on the discovery and development of new therapeutic leads for the treatment of unmet clinical needs in cancer; diseases such as malaria, tuberculosis, MRSA, stroke and Alzheimer’s; and rare and neglected diseases, such as Niemann-Pick Type C and NGLY1 deficiency. The collaborative program brings together chemical and biological expertise and technologies through partnerships with researchers in centers and institutes across campus and the country. Taylor’s own expertise focuses on exploring the potential of polyketide natural products as chemotherapeutic agents particularly directed at cancer and certain rare genetic disorders. Polyketides are produced by bacteria and, due to their diverse chemical structures, have equally diverse biological activities. Erythromycin, an antibiotic, and lovastatin, a cholesterol-lowering agent, are two such examples. Taylor’s research group uses both bacterial fermentation and chemical synthesis technologies to access compounds and explore the use for unmet clinical needs. A dedicated teacher as well as researcher, Taylor was awarded the Rev. Edmund P. Joyce Award for Excellence in Undergraduate Teaching in 2007. He currently mentors a research team that includes 16 undergraduates, graduate students and postdoctoral co-workers. He also serves as a member of National Institutes of Health Synthesis and Biological Chemistry A study section and is Fellow of the American Association for the Advancement of Science. For more information on Taylor, visit chemistry.nd.edu/people/rich-taylor. Originally published by Joanne Fahey at news.nd.edu on May 14, 2015.